Not sure what your point! Everyone recognizes that the 2002 recovery was a "jobless" recovery. Economic growth with no jobs being created. The 1991 recovery was very different, with plenty of jobs being created. Frozen in the North must also be frozen in the head...what a dumb comment and failure to miss a basic point!!! one cause for some concern is that new jobless claims might act a bit differently this time as benefits have been extended for much longer periods. therefore, people don't have to go back to work as quickly, nor are they likely to apply again in the same year as they are still covered which might reduce the number somewhat. worse, it means that the expected cost of a claim is now much higher driving states into bankruptcy. coloarado is already getting federal aid to pay unemployment. rhode island can't pay tax refunds. this is an ugly situation. absolutely, u6 kept heading up for 2 years after the 2001 recession, but employment was so tight in 2000 that it was literally impossible to hire. the peak of the recession was only 20% higher than the recent trough. u6 is currently 70% higher than the peak of the last recession. a stabilization here for 2 years will prevent a recovery. absolute levels for things like unemployment matter a great deal. anyone else notice that they revised Q1 GDP growth down today? The question should be why is this recovery so slow? Government has done little to help households get out from under their mountain of debt, and can't wait to pile on more debt, once households work their way through their debt. "The economy grew at a 3 percent annual rate from January to March. During normal times, growth in the 3 percent range would be considered healthy. But the country is coming out the longest and deepest recession since the Great Depression. So economic growth needs to be a lot stronger -- two or three times the current pace-- to make a big dent in the nation's 9.9 percent unemployment rate. The National Association for Business Economics predicts moderate economic quarterly growth in the 3 percent range through the rest of this year." Who are these 'alledged' everyones Frozen? Aren't jobs a lagging indicator of a recovery? Didn't the Bush tax cuts ameliorate the jobs situation relatively quickly? The problem I have getting any relief from this chart is that the data is lining out around 450,000 claims/wk. 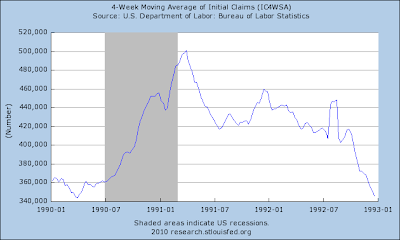 Following the last recession (that was often called jobless), the claims lined out around 400,000/wk. The number of people employed between the two periods is pretty close (136M vs 139M). Another way of saying this is that the workforce is 2% larger in this recovery, but the weekly jobless claims are 12% higher. Oh, we should not be at all concerned that initial unemployment claims have been "moving sideways" for the past five months as Calculated Risk has observed. 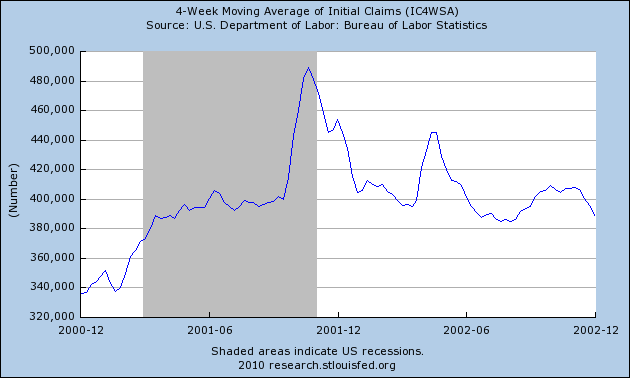 The rate of decline in claims from peak to the current week is about 3200 claims per week. But since the beginning of the year that rate has fallen to 512 per week. At this rate we'll be back to the normal level of 320,000 claims by July 2015. Faced with this DISASTROUS counter-evidence to your rosy outlook, here you are, trying to "console" us that the rate of decline was EXPECTED to fall as evidenced by previous recessions. Yet if you look at your own post history, commenters have been WARNING you the rate would decline and you dismissed those warnings. Remember your pretty Christmas tree - a present to the economy? Well it's not so pretty anymore, is it? Jobs have lagged the recovery only in the last 3 recessions. Prior to that, employment went up within 3 months if not immediately. Go to the Compare Recessions and Recoveries tab and select the Compare Recoveries bar. Go down to the Change in Output graph and this recession is second only to 2001 to being the slowest growth. You are absolutely correct OA. There's a lot of equivocation going on here. Payroll employment has ALWAYS coincided with the end of recessions. This is not remarkable because rising employment is one of the major factors by which the NBER calls the end of a recession. So it's tautological that employment is a coincident indicator. The unemployment rate, which is measured by a separate survey from payroll data, coincided with the end of recessions except for the last three. Do not confuse the rise in payroll employment with a falling unemployment rate though. First, they are the results of separate surveys. Second, the unemployment rate is a function of the size of the labor force which fluctuates. Initial unemployment claims has NOTHING to do with either of the other two measures. One would think that claims are related to the unemployment rate, but this is a common misconception. The perfect sign of an ignoramus is someone who says, "the unemployment rate is going down only because people have fallen off benefits." The unemployment rate is based on a SURVEY, not unemployment benefits. 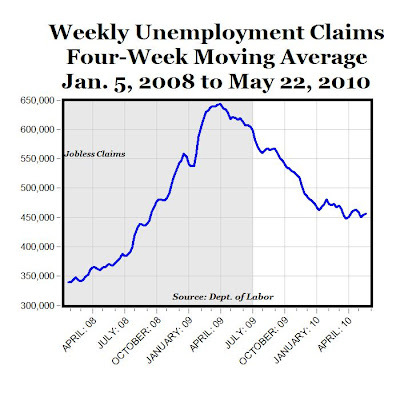 Initial unemployment claims is confounded with lots of claims which are ultimately INELIGIBLE for benefits. Seeing claims falling swiftly from peaks is not an indication that happy days are here again. It means that thousands of fools are finally learning they don't qualify for benefits. Continuing claims is a better measure because these people actually qualified. We still have 4.6 million continuing claims. Alas, this measure fails when people DO fall off benefits. Many of the unemployed are now on extended federal benefits and no longer on state rolls. Every week, unemployed people get one week closer to the end of benefits. Congress just expanded eligibility, but they did not extend benefits beyond November. Expanded eligibility should actually push initial claims upward - a distortion upward by policy. So all these measures are problematic in some ways and understanding their shortcomings is essential to properly analyzing them. The broader measures of unemployment (U4-U6) tell the story about part time and discouraged workers left off the "official rate". These are all still going up and the gap with U3 (the official rate) is widening. The labor force is declining rapidly in some states. The fact that initial claims remain elevated is not dispositive of a continued recession or a double dip, but it is certainly not good news. Continued labor market distress is no comfort just because this has happened before. We have no idea how long this distress will continue or whether it will get worse. 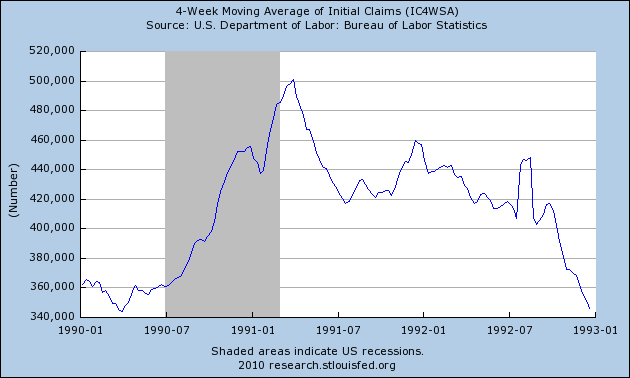 Claims falling from their peak is not indicative of a recovery. The area UNDER that chart, not the sharp decline, is a measure of how far we have yet to go. The bottom line is that if you are drawing broad inferences from this chart, you're a dufus. It's time to stop examining charts and start understanding the data in their totality. Technology is rendering more, and more jobs "obsolete." This means that, instead of going back to their "Old" jobs, workers are having to train for, and find, "New" jobs. Companies like Ford, for example, are bringing on "Production" a lot faster than they're bringing back "Workers." We, also, had a fair amount of this in the 30's. The last two charts cover represent the '91 and '01 recessions; here's a post that shows employment recoveries from prior recessions in the 20th century. It gives you an idea of how much worse things have gotten in this country. There are many commenters that are worried about job recovery including myself. But, there is a stunning employment statistic just reported for Feb. 2010: More people quit their jobs then were fired or discharged in February! This has not happened since March of 08. A sign of job prospect confidence? Oh-oh, US missed it's GDP forecast - and half the growth came from inventories! I think the real debate on this board is whether this recession represents a "V" or a "W". I think we have only seen one "W" since the great depression and it was the 1980-82 double recession. Since Mark chose the topic of discussion as 4 week average jobless claims (he can do that since this is his board), I went back to compare the 1980-82 period to today. 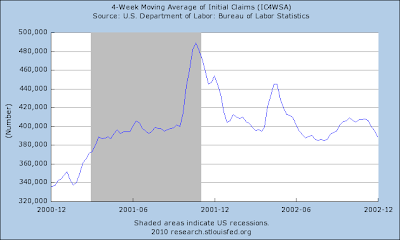 The current data on 4 week jobless claims is tracking VERY close to the the "W". 4 week jobless claims reached a botton during the week of 11/11/78 at 319K. It rose to 629K by 6/7/80 (+97% in 20 mo). It then fell to 410K by 12/13/80 (-35% in 6 mo). It basically held this level for the next 6 months, then started rising again and peaking at 674K by 10/9/82. It then fell back to normal at 339K by 2/25/84. 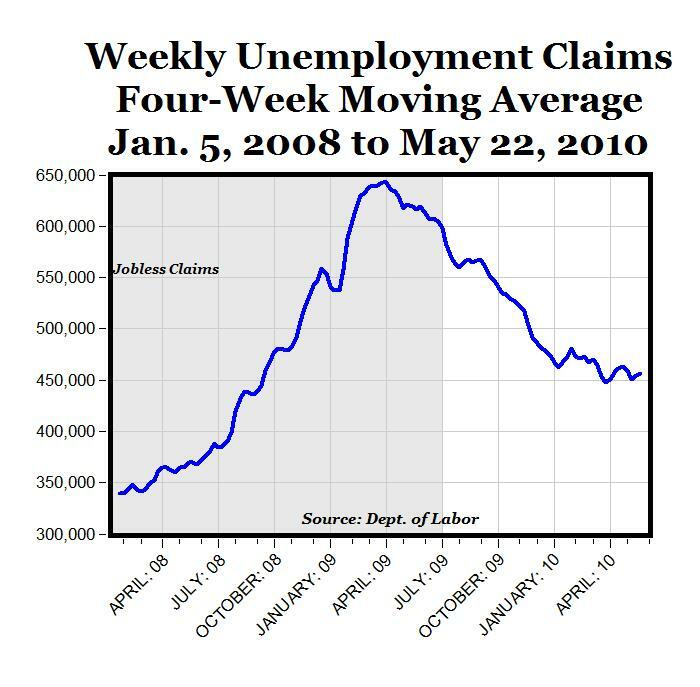 In our current time period, our jobless claims were at a low of 314K on 10/6/07 and rose to 643K by 4/4/09 (+105% in 18 mo). It fell to 462K by 1/9/10 (-38% in 9 mo). It has been essentially flat for the past 4-1/2 months. If it follows the 1980-82 pattern, first time unemployment claims will start to rise again around July. Will this happen? A government debt crisis (European, state, municipal) could certainly be a trigger for a second wave. "Government has done little to help households get out from under their mountain of debt..."
Peak, what would you have the boneheads do? Ron, I've explained it before. A $5,000 tax cut per worker over a year ago (or $750 billion for 150 million workers) would allow households to pay-down or pay-off their highest interest rate debts. Therefore, they'd have more money each month for consumption, to clear the market of excess assets and goods, and subsequently increase production (paying-down debt would also strengthen banks). The recession would've been more shallow and the recovery much stronger. It worked under Kennedy in '61, Reagan in '81, and Bush in '01 and '08 (the country was on a path to a mild recession after the early '08 tax cut, until Lehman failed in Sep '08). When a real recovery is underway, taxes can rise.